Kaviguru’s birthday is upon us today, and this Rabindra Jayanti we wanted to explore Tagore, the painter par excellence. 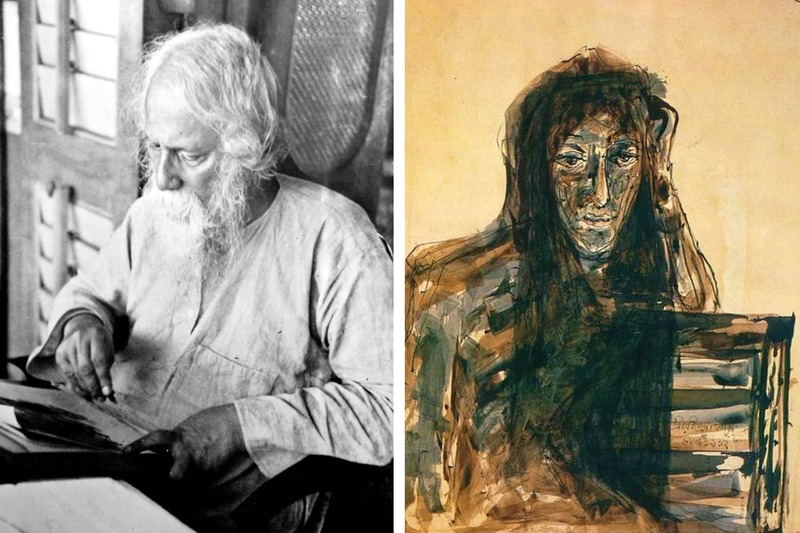 Though most of his painting are now acquired by Visva Bharati and other prestigious art museums in India, we went about looking for places where we can lay our hands on good prints of Tagore’s art. The Visva Bharati museum inside the Uttarayan Complex has the most abundant collection of Tagore’s paintings. With the museum showcasing some of his popular and rare pieces, the museum office is the only place where you can lay your hands to prints of Tagore’s paintings. From his Veiled Woman to Seven Figures, Viva Bharati museum office stocks up on a wide collection of Tagore’s paintings. You can buy them as a set of six or can also buy them individually. Most of them priced between INR 150 and INR 200, the museum office also stocks on some of his calligraphy prints! So, next time on a visit to Shantiniketan be sure to pick a few prints of the Bard’s paintings to put up on your walls. The CIMA gallery is the only one in Kolkata that curiously stocks up postcards and cards with paintings of Tagore on it. While they may not do as good as big prints, these postcards and cards are also unique in themselves and the prints are clear and beautiful. These cards make for great items for gifting and showcasing, and are reasonable priced at INR 50. India’s most prestigious art gallery, the NGMA (National Gallery of Modern Art, Delhi) has a large collection of original paintings of Tagore for display. While you can browse through the original paintings in the museum, you can buy big prints of them in the curio shop that is inside the museum premises. Interestingly, now NGMA also has an online store where you can buy some of Tagore’s prints while at home. Priced at a very reasonable rate, these paintings are great pieces to showcase in your casa. For more deets check here. This one stop online store is another interesting place we found wich stocks up on a wide collection of Tagore prints. From his self-portrait to the one named Kadambari Devi and his famous seals, this e-store stocks up prints of the Brad’s paintings in different sizes. You can not only pick your choice, but can also choose if you want it framed or wrapped for delivery. With plenty prints to offer, this store is a must visit if you are planning to grab some good Tagore prints. Get more info here. One of Kolkata’s iconic landmarks, the Jorasanko Thakurbari, Tagore’s home in Kolkata, has for long been transformed into a museum. While the museum houses several of the Bard’s original paintings, the museum office stocks up a good collection of prints of Tagore’s paintings. From his landscape ones to hi portraits, you can grab these prints at the museum office for as low as INR 100.